Foot Warmer offers pleasant warmth for the feet. Soft lining provides ideal comfort and keeps your feet warm and cozy. 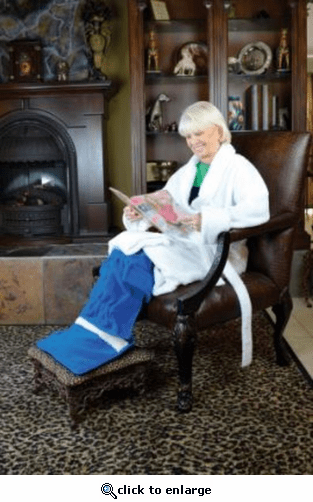 The Advocate Foot Warmer allows for constant distribution of warmth during use with four temperature settings to choose from. The interior and exterior covers can be removed and washed. I love this foot warmer but I would have given it a 5 if the top of my foot would also get warmed. And the gap between the bottom part (where the feet go) and the top part (where the leg goes) has a small area that is uncovered and it would be nice if this area could have been made with a piece of material that came down to cover the very small gap. ProsI use this each evening for about an hour before I go to bed to warm my feet, and it warms them enough that I can go to sleep. Prior to having this gift from my husband, I would go to bed with cold feet, have heavy blankets on, wear socks, and have to rub them before I could go to sleep. ConsWould be nice to have another small warmer, that was a very, very low temp, on top of the foot to warm, and a piece of the material to fold down between the two parts to cover a small gap that air comes in while warming. I still have to use a throw over this area to keep the cool air out of the small gap.